SEC. XLIV. THE SOIL AND ITS PRODUCTS. Yucatan is a land of less soil than any I know, being all live flat stones with very little earth, so that there are few places where one can dig down a fathom without meeting great banks of large rocks. The stone is not very good for fine carving, is hard and coarse; but such as it is it has served to produce the great number of buildings in the country. The country is excellent for lime, of which there is much; it is a marvel how much fertility exists in the soil on or between the stones, where is to be found all there is, more among the stones than there is elsewhere; since on the earthy ground where it is to be found; no trees grow, but only grass. But where they sow over the stony parts they secure crops, and all the trees grow, some of them marvelously large and beautiful. The cause I think is that more moisture is preserved among the stones than in the earth. whereas here all run in secret channels underground. As we have been told, the entire coast is full of springs of sweet water, rising in the sea, and from many of which one can get water, as I myself have done, when the ebb tide has left the shore dry. natural rock, which the Indians call cenotes, cut and reaching down to the water; at times there are below furious currents so as to carry off cattle that fall into them; all these go out into the sea, and from them the above springs come. These cenotes contain fine water and are a great sight, for some of them are of cut natural rock clear down to the water; others have mouths that God created, or were caused by the accidents of thunderbolts (such as often fall), or in other ways. Inside we, find handsome arches of the living rock, while on the top are trees, so that above is forest and underneath the cenotes; in some a boat may be taken and used; with others larger or smaller. The people who got to these cenotes drank of them, having no wells, or very poor ones due to their lack of tools. Now however we have given them work at making good wells, as very excellent pumping wells whence the water can be taken as from a spring. There are also found lagoons, but all of these are of brackish water, bad to drink, and without the currents found in the cenotes. found to be almost converted into stone. This was still two to three fathoms from the water, before reaching which we came to a hollow arch, made by God, in such fashion as that the grave was set within the rock, and one could walk underneath to where it was. We could not understand how this could have been, unless we might say that the grave was opened there on the inside, and afterwards by the moisture of the cave, and the lapse of time, the rock hardened and grew to close it up. Besides the two rivers which we have said are in the country, there is a spring three leagues from the sea near Campeche that is brackish; and in the whole land there is no other, nor other waters. The Indians living toward the sierra, needing to have their wells very deep, are accustomed to gather the rain water for their homes in that season, in great cavities in the rocks; because very heavy rains come then, with much thunder and lightning at times. All the wells, especially those near the sea, rise and fall every day at the hours of high and low tides, showing clearly that the underground rivers run into the sea. 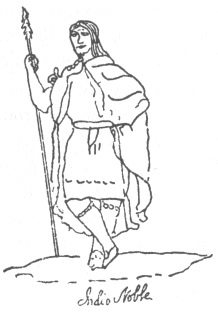 94:* p. 93 In seeking to illustrate the objects of use referred to by Landa we are helped by the known extent of their trading relations, from Honduras as far as the Mizteca region. Cortés needing to cast brass cannon sought and found the needed source of tin, and that this hardened copper was a part of the Tabasco trade we know. Landa also speaks in his last chapter of fire-hardened spears, a weapon hard to find still surviving as a specimen. 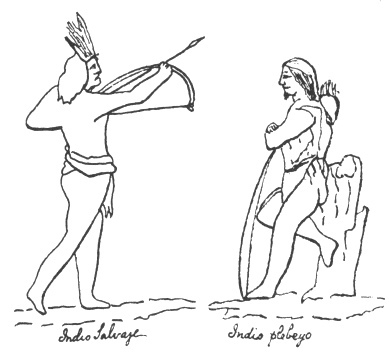 The same with their ancient bows and arrows. Even the marginal figure here referred to in the text has been left out in the transcribed copy of Landa's manuscript; all however without leaving us wholly without pictured reproductions. 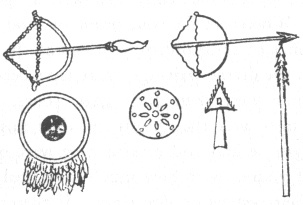 Of the illustrations on these pages the collection of implements is taken from the manuscript of Fuentes y Guzmin's history of Guatemala, as also are the interesting human figures representing native bowmen, and also an "Indio noble" holding what is clearly a spear of hardened wood. Of the three small figures in the margin above we have a copper axe from an original Mexican codex, a copper bell from the p. 94cenote at Chichén Itzá, and an illustration of the use of one of the very copper chisels to carve the 'idols,' from the Madrid codex. A chipped flint sacrificial knife, also from the cenote, has been shown previously.